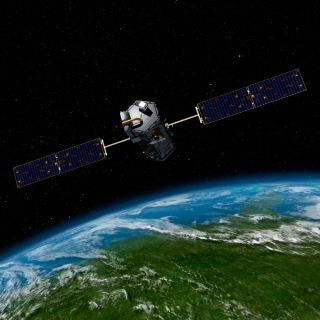 NASA's newest satellite has arrived in its final orbit and begun tracking levels of the heat-trapping gas carbon dioxide in Earth's atmosphere. The Orbiting Carbon Observatory 2 (OCO-2), which blasted off July 2, arrived in its final orbit 438 miles (705 kilometers) above the Earth on Aug. 3. The satellite then collected its first test data three days later while flying over Papua New Guinea, agency officials said. "The initial data from OCO-2 appear exactly as expected — the spectral lines are well resolved, sharp and deep," OCO-2's chief architect and calibration lead, Randy Pollock, of NASA's Jet Propulsion Laboratory in Pasadena, California, said in a statement Monday (Aug. 11). "We still have a lot of work to do to go from having a working instrument to having a well-calibrated and scientifically useful instrument, but this was an important milestone on this journey." OCO-2 is the first operational NASA satellite dedicated to measuring atmospheric levels of carbon dioxide, which scientists say is largely responsible for Earth's recent warming trend. Concentrations of the gas in Earth's air have risen from 280 parts per million (ppm) before the Industrial Revolution to about 400 ppm today, primarily due to the burning of fossil fuels and other human activities. OCO-2 will use its single scientific instrument, a grading spectrometer, to gather precise CO2 data thousands of times each day, helping researchers get a much clearer picture of how the gas is cycling through the atmosphere — what sources are pumping it out, and which "sinks" are sucking it up, NASA officials said. The OCO-2 mission team will calibrate the spacecraft's spectrometer over the next few weeks. The satellite will also beam to Earth up to 1 million scientific measurements every day, to help test out data-processing systems on the ground, NASA officials said. The $465 million mission should start delivering calibrated science data before the end of 2014, they added. OCO-2 is virtually identical to the original Orbiting Carbon Observatory (OCO) satellite, which was lost during a launch failure in February 2009.